Cactus is a naturally spawned plant in desert biomes respectfully. It is renewable, as it can grow. It will grow up to 3 blocks tall unless placed taller. 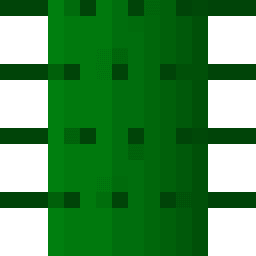 Cactus will break if there is a block next to it, or if it's not on top of sand, or another cactus block. All mobs will take damage if they collide with a cactus. This makes for a good mob trap, especially for spiders, who will try to climb it. Unlike a lava trap, a cactus trap will also loot their victims. If the player tries to walk throught cactus it will take damage too on survival mode. You can smelt the cactus to create green dye, which is used to color White cloth.